You'll be hydrating in style with this ultra-chic black-finish stainless-steel travel tumbler. A must-have for work, play or travel this sleek cup is designed with double wall construction to keep your beverage hot or cold for hours. The plastic suction-push-top lid and straw help keep your beverage in place when on the go. 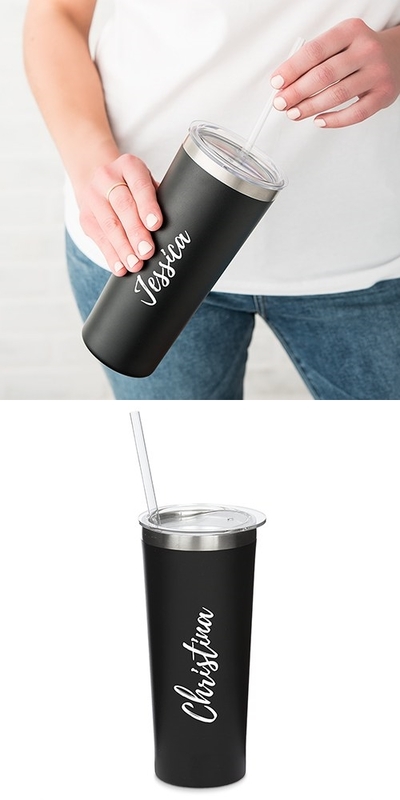 Add to the style of this travel tumbler by adding a custom name or message in a distinctive vertical calligraphy print. Pictured straw is included. BPA free.